It was Saturday night, Halloween 1992, and my advance copy of the New York Times Magazine had arrived earlier in the week with just the right menu for the dinner party I was planning for some special friends. It was unique, time consuming, memorable, and yet I’ve never repeated it and really ought to, this time without the interruptions of our doorbell ringing every ten minutes with under-costumed local children begging for candy. The centerpiece of the meal was a rustic duck stew, prepared with 3 5-pound Peking ducks each cut into 8 pieces. For that, I had asked my friend Ching Ching, owner of our favorite Chinese Restaurant, to have her kitchen sell me three of her raw ducks cut up into the required pieces. Again, a bargain, and a time-saver learned from exposure to Chinese cuisine. The meal began with a salad of friseé with shrimp, fennel, and clementines, and the stew was served with pappardelle tossed with grated cheese and a brussels sprouts hash. This was several years before this much-maligned green vegetable became popularized in ways other than the flavor-killing boil. After such a hearty meal, the dessert was a simple pear and almond crisp. 1/3 cup plus 2 tablespoons sherry wine vinegar; salt and freshly ground pepper to taste; 1 cup plus 3 tablespoons light olive oil; 4 small shallots, minced; 1 pound large shrimp, shelled, deveined and split lengthwise; 2 medium fennel bulbs, trimmed; Juice of 1 lemon; 2 heads frisee; 5 clementines or tangerines, peeled and sectioned, with pith and pits removed. In a mason jar or salad dressing carafe, combine 1/3 cup of the vinegar with a pinch of salt and pepper. Add 1 cup of the olive oil and the shallots. Cover and shake vigorously until the dressing becomes thick. Set aside. Season the shrimp with salt and pepper. In a large skillet heat the remaining olive oil until hot. Add the shrimp and saute, stirring constantly, until cooked through, 2 to 3 minutes. Remove the shrimp to a bowl and toss with half of the dressing. Deglaze the pan over medium heat with the remaining vinegar, pour over the shrimp, cover the bowl with plastic wrap and set aside. 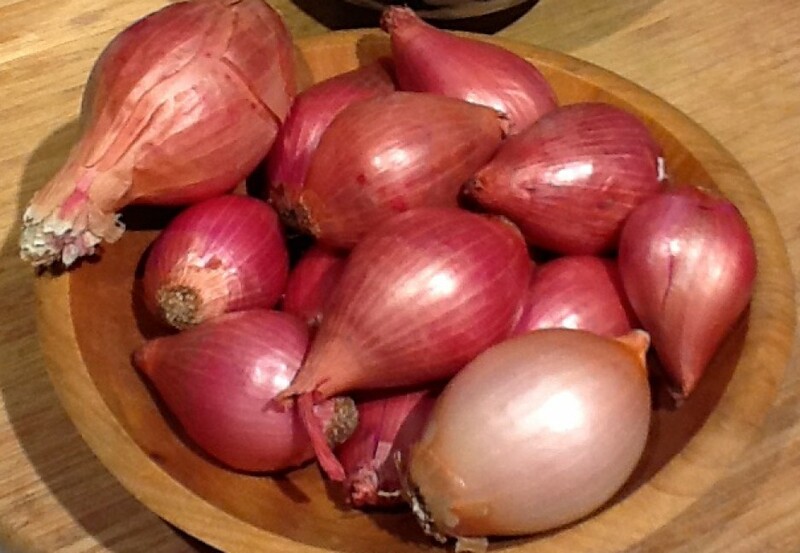 Halve the fennel bulbs and cut into 1/4-inch slices. Toss with the lemon juice. In a large bowl combine the fennel, frisee, orange sections and remaining dressing. Mix in the shrimp with its dressing and serve immediately. 3 5-pound Peking ducks, each cut into 8 pieces; salt and freshly ground pepper to taste; 1/2 pound pancetta, cut into 1-inch-by- 1/4-inch pieces; 3 large sweet onions chopped; 1 head garlic, minced; 1 2-ounce tin anchovies, drained; 1 pound carrots, cut on the bias into 1/4-inch slices; 1/3 cup flour; 2 cups dry white wine; 1 cup Nicoise or gaeta black olives, pitted and chopped; 1 large bouquet garni; 1 bunch fresh thyme sprigs, tied with string; 3 bay leaves; 1 teaspoon cayenne pepper (or to taste); 1/4 cup balsamic vinegar; 1 16-ounce can peeled tomatoes, drained; 6 cups chicken stock; 2 pounds pappardelle or fettuccine; 2 tbsp olive oil; 1 cup grated Pecorino romano. Sprinkle the duck pieces with salt and pepper on both sides and let sit for 30 minutes. Heat a large, heavy stockpot over high heat, then reduce the heat to medium and brown the pancetta, stirring constantly, until golden brown. Remove with a slotted spoon and set aside to drain. In the same pot, brown the duck pieces on both sides over high heat, a few pieces at a time. Be careful of spatters – the deeper your stock pot, the less messy this will be. Remove from the pot and drain in a colander. Pour out all but 1/4 cup of duck fat and reduce the heat to medium. Add the onions and garlic, stirring until translucent. Stir in the anchovies and carrots and cook for 2 to 3 minutes. Add the flour and cook for 2 minutes, stirring, until the flour absorbs the duck fat. Stir in the wine and olives and increase the heat to medium-high. Return the duck pieces to the pot, add the bouquet garni, thyme, bay leaves, cayenne, balsamic vinegar, tomatoes and enough stock to cover. Stir well and bring to a boil. Reduce the heat to a low simmer and cook for 30 minutes, stirring every 10 minutes. Skim as much duck fat as possible from the top of the pot. Cook the stew for another 45 minutes, or until the duck is fork tender. Adjust the seasonings. Just before serving, reheat the stew over medium heat. Bring a large pot of lightly salted water to a rolling boil. Add the pasta and cook until al dente, about 12 minutes. Drain and pour into a serving bowl. Immediately toss with the 2 tbsp of olive oil and then the grated cheese. Serve immediately with the stew. 2 pounds brussels sprouts; juice of 1 thin-skinned lemon; 1/4 cup olive oil; 4 cloves garlic, minced; 2 tablespoons poppy seeds; 1/2 cup dry white wine; Salt and freshly ground pepper to taste. Cut off the stems and halve each spout lengthwise, then slice each half into thin slices, about 1/8-inch thick, and place in a large bowl. Add the lemon juice and toss. Heat the olive oil in a saute pan almost to the smoking point. Stir in the sprouts with the lemon juice, the garlic and the poppy seeds. Add the white wine and toss for about 3 minutes. The sprouts should be bright green and barely crunchy. Reduce the heat to low, season with salt and pepper and cook for 1 minute. Serve immediately. 4 pounds ripe pears cored and peeled; 1/2 cup pear brandy or Armagnac; 2 tablespoons sugar; 1/2 cup chopped toasted almonds; 1 3/4 cups flour; 1 cup brown sugar; 1 teaspoon cinnamon; 2/3 cup unsalted butter, softened; 1/2 cup crushed amaretti cookies; vanilla ice cream. Halve the pears and cut into 1/4-inch slices. Place the pear slices in a bowl, sprinkle with the brandy and sugar and gently stir with a wooden spoon to coat evenly. Set aside for 15 to 30 minutes. In a mixing bowl combine the flour, brown sugar and cinnamon. Mix in the butter, working with your fingers until the mixture holds together and is crumbly. Stir in the chopped almonds and the crushed amaretti cookies. Set aside. Place the pears and their juice in a 12-inch round ceramic tart pan. Spread the almond mixture evenly over them. Bake for 1 hour or until the pears are bubbling and the topping is golden brown. To serve, scoop out the hot crisp into individual dessert bowls and top with a scoop of vanilla ice cream.